Our take on his comment is that the fewer the lines (ropes or fuel) the better time the ship's occupants and captain will have. This becomes especially apparent when the lines are low voltage cables, electronic modules, basic batteries, few switches, safe fuel (Sun), engines (motors) the wife can lift, no oil smell, exhaust and a litany of 'less stuff' for which to care. Oh, and all at a leisurely sailboat speed. 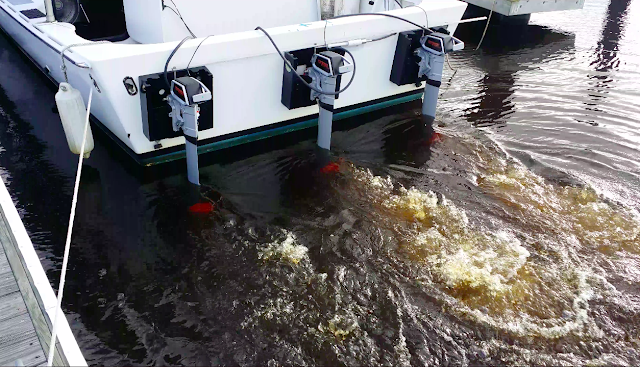 The three Torqeedo motors are very small but their 12 inch diameter props are highly efficient for the 40 foot Totally Electric Powered Solar (TEPS)tm boat, as shown here in a still picture from a video. 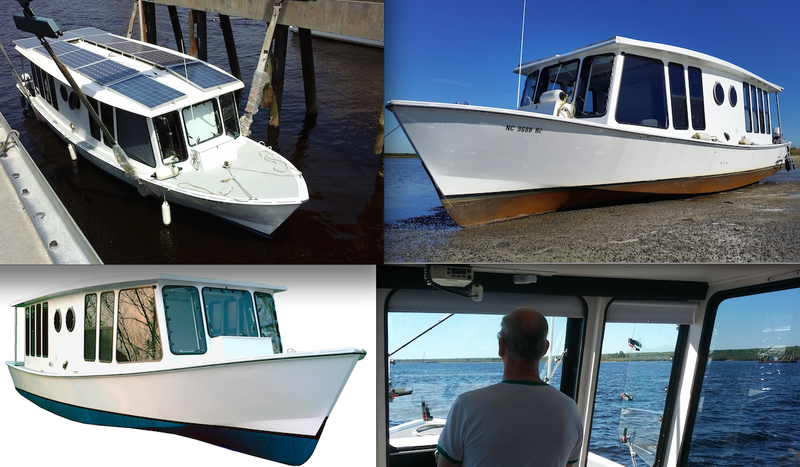 An example might be that the new power drive system, at this time, is by Torqeedo electric outboards. Similar horsepower inboard motors are also available from the company but our affinity for really shallow 18 inch water then beach the boat, seems to indicate 3 kickers instead of fixed propellers and rudder stock. 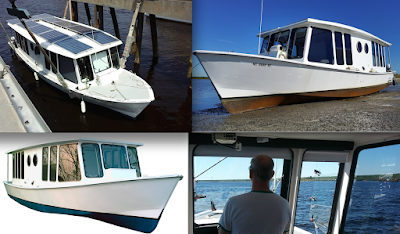 Totally Electric Powered Solar (TEPS)tm boat is gracefully aground to access remote beaches with an 18 inch draft. The forefoot is protected by a unique planking while the bottom is protected by twin robust keels. 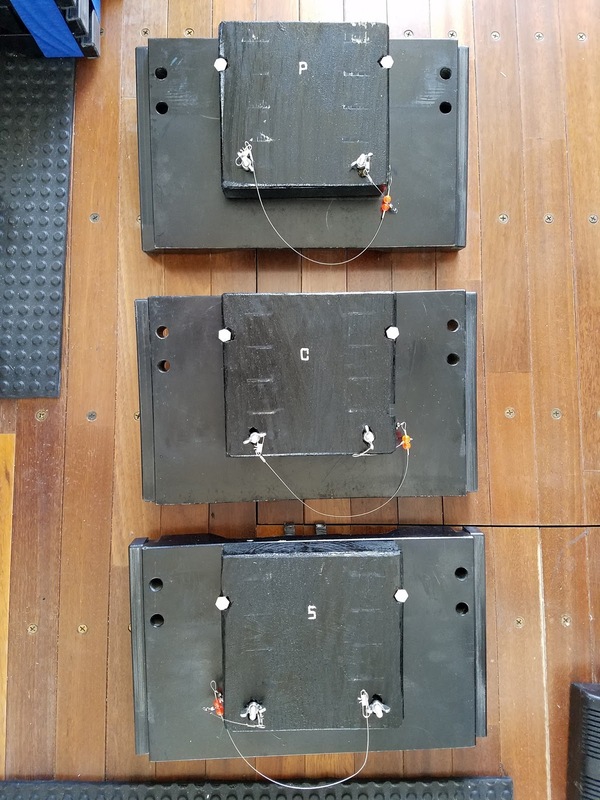 All three motors applying considerable reverse thrust to the stern while the additional securing bolts on the jack plates transfer the tension evenly to their jack plate assembly. The motors are powerful enough to drive the boat at her max hull speed of 8 miles per hour (7 knots) yet removable at the end of the day so that all three can be stowed away in 20 minutes without raising a sweat. Details such as bolts that further secure the motors after the clamps are tightened are provided as well as a simple method to insure that the stainless steel wing nuts do not inadvertently join the briny deep by fumbling fingers. Simple wire retainers such as pictured keep the owner and captain very calm and cool during placement and removal. to hold the motors firmly to the plates during reverse. The jack plate can stay in place while removing the motor or the motor and the jack plate can be removed as a single unit. Motor assembly weight is 42 pounds with an additional 8 pounds with the plate attached. There is more to do to get ready for this summer's contribution to logging more miles on the Great Loop adventure. Most of the miles will be close to Wilmington as we test the system further and go even farther in North Carolina waters.